Berries are a naturally sweet treat. They are a type of fruit that evolved to have bright colors and a high sugar content to attract birds and animals, including humans, in order to aid in their dispersal and multiply throughout their ecosystem. Botanically, berry is technical term for the fruit of a single flower that has a soft skin. By this definition, tomatoes, blueberries and grapes are berries; strawberries, raspberries and cherries are not. However, to most people, a berry is any small, sweet fruit. 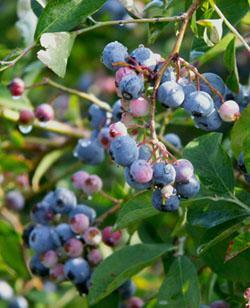 Growing berries in your garden is easy and rewarding. Eating sun-warmed fruit straight from the bush is one of the simplest garden pleasures. Stepping out the door to grab a handful for a bowl of cereal is also hard to beat. Growing foods with kids is especially fun, and a great learning tool, too. Where food comes from, how plants grow and what animals live in your neighborhood are all questions that can be explored together while growing fruit. Besides being an enjoyable pursuit, growing plants at home is cost effective and good for your health and the environment. Grocery store produce is often expensive and contaminated with agricultural chemicals. Organic fruit, especially those grown locally, are better choices. Berries are excellent sources of vitamins and antioxidants. The following varieties are listed by botanical family. Within families, plants generally have roughly similar traits and cultural requirements. Juneberry, Serviceberry-sweet purple to black fruits resemble blueberries. Glossy black chokeberry-tart fruits are popular for juice making. Blackberries-Large, fragrant fruit, a favorite with hikers, kids and birds. Raspberries-Red raspberries are the most used in cooking. They have a hint of tartness. Black raspberries-Intensely sweet and perfumy. Thimbleberries-Shallow, bright red fruits grow in partial shade. Boysenberries- A cross between different raspberries. Salmonberries-Tall plants with delicate, pale colored fruit. Cloudberries-Low growing plant with golden berries. Dewberries-Bristly plant, native to Europe. Sweet black fruit. Strawberries-Large, juicy red fruits with small seeds on the outside. Wild strawberries-Tiny, intense red, pink or white fruits on everbearing plants. Rose hips-High in vitamin C, good for tea. Red currants-Long stems of little red fruits are popular in baked goods. Black currants-Larger, dark fruits are good as juice or in pastries. Gooseberries-Round, with a smooth or bristly skin. Blueberries-Blue fruits that are blushed with a white coating. Cranberries-Tart, small native cranberries are the best in sauces. Huckleberries-Red or black species are good fresh or dried. Ligonberries-Small, distictly tasting fruit that is important in Scandinavian cooking. Mulberries-Juicy, red, black or white. Elderberries-Small black balls with cruchy seeds are made into wine, cake or juice. American highbush cranberries-Bunches of red balls improve in taste after a cold spell. Berries are most often eaten fresh or in pies, preserves, jam, jelly and chutney. They make great topping for ice cream or shortcake. They are lovely in pancakes, on waffles and in smoothies. Dried whole or as fruit leather, they are a welcome snack on the hiking trail or mixed into hot oatmeal. In the garden, plants make a wonderful addition to an edible landscape. Most plants are shrubs, though some are herbaceous perennials or small trees. Many plants are quite attractive, especially blueberries with their bright fall foliage, June berries with apple-blossom type flowers and wild strawberries with continuous flowers and jewel-like fruits.